Mo Hayder is the famous British author of the Jack Caffery crime thriller series. The Birdman was her debut novel and it became almost an overnight success, which is quite rare for an author’s first novel. The Guardian called it ‘first-class shocker’ and with good reason. It is gory, violent and quite disturbing, but oh so delicious to savor. It is the book that made me acquainted with the author, whom I’ve been following ever since. The Jack Caffery series includes 7 books, with the latest one, Wolf, published in 2014. Here are the Mo Hayder books in order for her series and standalone novels. Mo Hayder (website) was born in Essex in 1962, daughter of two academics (mother was an English teacher). Coming from a rather complicated family (parents split up, she literally hated her brother when he was born, even tried to kill him by pushing him down the stairs – thankfully her grandmother got him), she left school (Loughton County High) before her 16th birthday, running away to London where she held various odd jobs. At the age of 25, after a brief marriage, she moved to Japan where she worked as an English (as a foreign language) teacher and educational administrator, along with being a club hostess in Tokio. This allowed Mo Hayder to finance writing her first book, Birdman. As a child, she read many books, but she didn’t get the idea of becoming a writer until her late thirties. While living in Japan, the author saw several people die in various ways over six weeks. This was also an inlet for her (maybe an unconscious one) to get ideas for some of the gruesome murders featured in her books. After leaving Asia, she enrolled in Los Angeles in a filmmaking course. She got a Master’s degree from the American University in Washington DC in filmmaking, as well as a Master’s degree from Bath Spa University in the UK in creative writing. Her standalone book Tokyo is loosely based on the place she’s been living for a while and some of her experiences there (e.g. with the Japanese underworld culture). Her book The Treatment, the second in the Jack Caffery series has been made into a Belgian film with the title De Behandeling in 2014. The author got the idea for her book The Poppet while watching Slingblade written by Billy Bob Thornton. Some of the earlier scenes featured patients in the mental institution, who were in for violent crimes, would enjoy remembering their crimes. Also, the doll (poppet) came about while Mo was walking around the voodoo shops in New Orleans. 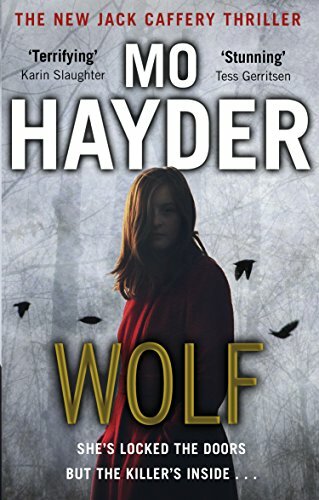 In Wolf by Mo Hayder, the author departs somewhat from her usual style of crime investigation, this time making it personal for Jack Caffery. The Walking Man wants Jack to help with a case, and in return, he would give Jack additional information about Caffery’s brother. How can Jack say no to such an offer? This is the one book which could be also read as a standalone since, except Jack and The Walking Man, none of the other regular characters appear. However, for the sake of learning more about Jack’s character, reading the Jack Caffery series in order is advisable. Each of her novels became a huge hit, with a wide acclaim all over the world. Currently, Mo Hayder is a full-time writer, living in South West England.